Savour beautiful sea views of Alassio, from this gorgeous holiday duplex with scenic private terrace! Enjoying far-reaching sea views from its elevated setting in Alassio, this modern air-conditioned duplex provides an effortless holiday base for family groups of 5. Inside, the 2-level apartment offers a bright and inviting open plan living space with far reaching sea views to take in and a stylish sofa, and chic kitchen diner provided. The stylish space leads out to a sunny private terrace furnished with an alfresco dining area. 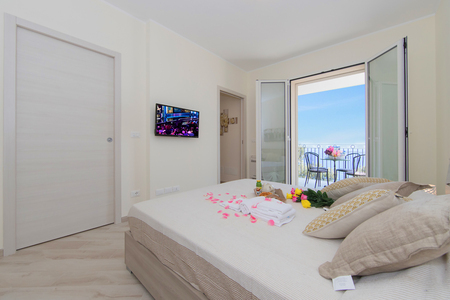 The apartment also benefits from a spacious sea view double bedroom with TV and terrace access, a second family bedroom with bunk beds and single bed, alongside two contemporary fitted shower rooms. Subject to availability, larger groups looking to stay can also rent Serena 1 (ID 3182), which is also sleeps 4. The Serena 2 has a choice of eateries and the lido beaches and visitor attractions of town are all within a 6-8 minutes’ drive away. Sleeping- Bedroom 1: A restful sea view double room with wall-mounted TV, wardrobe & terrace access Bedroom 2: A modern family room with bunk beds, a single bed & wardrobe Bathrooms- Bathroom 1: A modern fitted shower room with basin, WC & bidet Bathroom 2: A contemporary fitted shower room with basin, WC & bidet Additional- • FREE WIFI • PRIVATE GARAGE AVAILABLE • Air conditioning • Satellite TV • Washing machine • Pets allowed • Parasol • 24 external steps • 12 internal steps Location: The modern 2-storey residence is situated along ‘Via Ollandini’, 6-8 minutes’ drive from a selection of authentic eateries, a seafood restaurant, the famous gardens of Villa della Pergola, the Torre Saracen ruins and the beautiful lake lido beaches. Perfect for relaxation by the sea, Alassio is also the ideal holiday destination for action. From diving, SUP hire, sea-scooters, yacht and boat rentals to fun land-based activities including hiking, paragliding, road biking, long distancing cycling, Nordic walking, canyoning and kayaking, Alassio offers something for everyone! July 2018 Top Location! Jens, Germany " Jens Hochhaus "